Our Nurturing Infant Care Encourages and Supports Your Baby’s Growth! Our Young Scholars Academy Infant Program is designed to stimulate your baby’s cognitive, emotional and physical development. By breaking up our curriculum into different development age groups we can better focus on to what encourages socialization and language development. For instance for ages 0-3 months “Beginners” we introduce all areas of growth to get that brain stimulated! 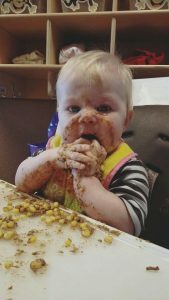 3-6 months we like to refer as “Explorers” where in those months we get super messy and get into everything! In the 6-9 month range, the “Tuners” are working on figuring out what they like and don’t like and definitely letting us know! It is the “Little Independent” stage (9-12 months) where our infants discover more about themselves and their friends. In each age we have curriculum that we focus on to include language and literacy, fine and gross motor, music and movement, art and sensory play and even social & emotional growth! Breaking up our curriculum allows us to have a more focused day and give the individual attention your infant deserves! A big goal we have here in the infant room is sign language! 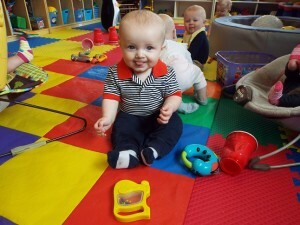 We start and focus on basic self-help skills to help communicate the needs of our infants. Research has shown that using sign language at a young age can better help your child when it does come time for them to start becoming vocal and communicate through a different medium. It is in later months and other classrooms when sign language is used more in association with the weekly themes in curriculum. It is vital to meet the needs of our infants–and using sign language is a great way to communicate with the babies! You will see your child make great strides in their cognitive recognition when they practice sign language at Young Scholars Academy. In our infant room we go off of your family’s schedule, this includes feedings, changes and nap times. It is when our team gets to know you and your family we are able to develop a routine and your child personally and his or her traits and dislikes furthering connections with the babies. We are able to communicate with our families many ways in our Infant Room! One way you can have this is the Infant Daily News which are sent home every day with you showing times when feedings and changes have taken place. As of February 2017 we are actually introducing LifeCubby where you will able to track throughout the day your babies eating, naps and send messages to the teachers! Young Scholars Academy believes that the more communication the better! We also have an open door policy so you are more than welcome to come and hang out whenever you can- perfect for breastfeeding moms! Our nursing room, located right in the infant room is great if you are a breastfeeding mom and are able to sneak away from work to connect with your baby throughout the day. 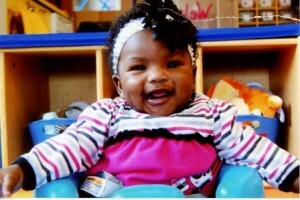 Infants and babies love Young Scholars Academy! Let us explain how our 2 infant classrooms work. The Colorado state ratio is 1:5, you can expect this to be met at all times. In Infant A we have 2:10 ratio, in our Infant B classroom you can find the ratio to be 2:7. Now this means that dependent on openings you could choose the classroom with the smaller ratio. To find out openings give us a call at the center, 719-522-9099. Both infant classrooms at Young Scholars Academy are designed to include separate areas for diaper changing, playing, napping and feeding. These classrooms provide a nurturing and safe area for non-mobile infants and a gentle play area for mobile infants. Outdoor time is also available daily (weather permitting, of course!) for fresh air, a change of environment, and for gross motor development. In this time we are able to do our curriculum through messy media, sensory play and movement. 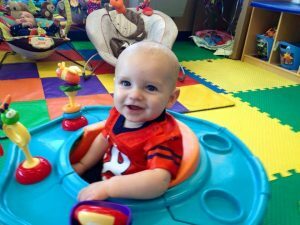 At our center your baby gets the best Child Care!